4,500 Avios award dies officially on 2 February 2016. 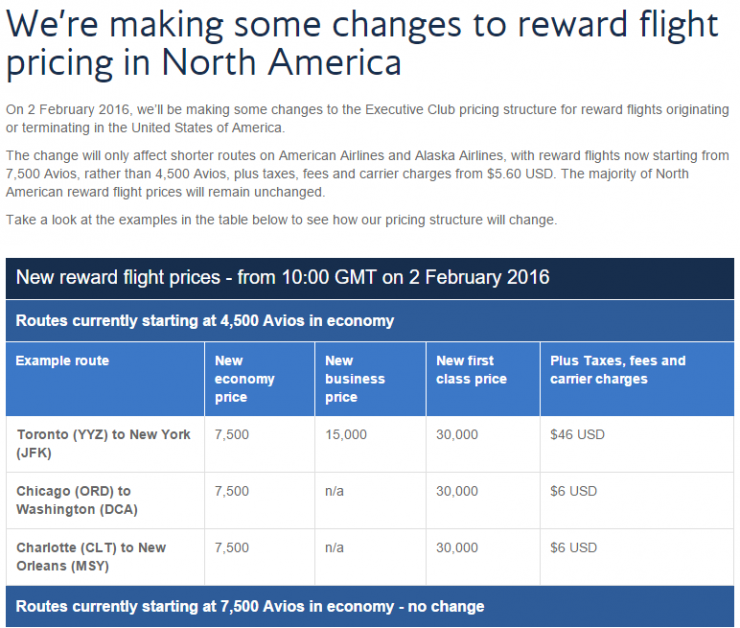 7,500 Avios points becomes the “floor” for North American routes. 7,500 Avios awards do not change. But wait, its not the end of the world! 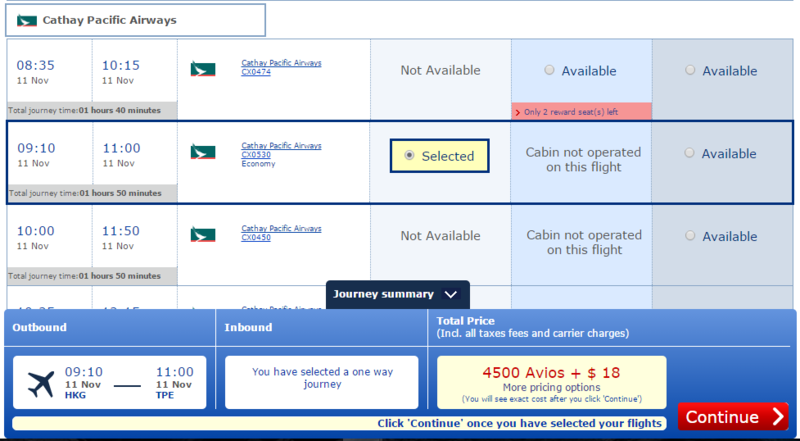 4,500 Avios awards still exist with excellent availability, outside of North America! Or another region perhaps, Hong Kong to Taipei? So there you have it. The world hasn’t ended, you’ll just have to pay a little bit more for those short hops up in North America. British Airways’ announcement of the end of 4,500 point awards in North America is unfortunate, but I don’t see it as the end of the world. There is great availability elsewhere. The real question that this all raises for me, is whether something said a few days ago on an American Airlines earning call, could have somehow influenced this. I think that is easy for you to say but for someone that flies a 4500 route VERY frequently in order to see our daughter, this is a tremendous blow. Effectively doubling the cost of this flight. That means we will get to see her half the amount of time. @Jessica – I’m sorry to hear that. It was an excellent deal. Errr. Those “routes” were not created for you, nor was the mileage program. Too bad — So sad. I will add that not all of us are able to take exotic vacations from Doha to Dubai or Hong Kong to Taipei. Between work, kids, family, and other responsibilities, my husband and I are lucky to get a 3 day weekend escape. Which we really enjoy. And these are usually close to home. I’m not trying to beat a dead horse, I just hate when bloggers forget about the average traveler. I mean, Geez, do you really think that most travelers in America are using Avios to fly Doha to Dubai? Sure, there is a select group that utilizes this option but most people use avios to fly BOS-DCA, ORD-YYZ, DFW-DEN, LAX-LAS, JFK-YUL, SFO-PDX, MIA-CUN (and many other destinations in the Bahamas and Caribbean). And the list goes on and on…. My point is, an increase of 66% on the most used redemption method for Avios is a HUGE deal. Why minimize it? @Jessica – My point was not to minimize the loss of 4,500 avios awards in North America, rather, to highlight that there are still 4,500 awards elsewhere in the world. Believe me, I know a lot of people will be hurt just on DCA-JFK flights. And as many have already stated on twitter.. 7,500 avios, while nearly 50% more, is only 3,000 more, and still 5k cheaper than using American Airlines. Its, not the end of the world, Trevor. Moreover, you could do far better cost wise by taking the buses to NYC and then mass transit from NYC to the NYC airports. It appears that Jessica is unique in her loss from the DC metro area, but then again, NYC to ORD is 7,500 AVIOS — not miles, Jessica, there is a difference — and she just loses a number of lower priced routes that most of us don’t have access to, that’s all. Not the end of the world, even for her. And, by the way, I don’t buy the tearjerker that she will have to visit her daughter less because the Avios price on the route has gone up!! Some people have no shame, whatsoever. @Jessica- I certainly understand your frustration about this devaluation. Although higher in cost you still have the ability to fly on short notice without paying AA’s fees. My frustration has always been that inability of using the 4500 award due to the fact that I dont live in a AA/US hub. Here in BUF 4500 avios gets me BOS,ORD,PHL,DCA,CLT. That’s it. (Prior to the merger all I had was ORD!) I have used the BOS flight a number of times but when I can buy a ow fare of $64 the 4500 avios is not such a good deal. I have also used avios for annual trips to PBI. That required 9K each way (via CLT not PHL or DCA since they are further from PBI). Now, 15K each way. Bottom line is its another devaluation that we have no control over……. So with the old award chart you could get to BOS,ORD,PHL,DCA,CLT for 4500 miles and then go to an many other places for only 4500 more miles. 9000 miles one-way for loads of possibilities. Now it will cost you 7500 to get to BOS,ORD,PHL,DCA,CLT plus another 7500 (minimum) to get any where else. To me, this is especially harmful to those that don’t live in a AA hub because they will be paying a minimum of 15000 each way to get to their destination which is more than any US-based airline for domestic flights. Small hops from hubs to your home airport will now cost 7500. This completely obliterates ANY connecting flights in America; making all flights with connections higher priced than US competitors. Get a grip. I don’t fly those exotic routes, nor do I expect to. I mainly fly coach and yes, the devaluation hurts, but it is not the end of the world. Check out using IB Avios for your shorthaul flying to see your daughter in DC. Otherwise, pony up the dough or the extra points — the program was not made for you or your short hauls, and the rest of those destinations that were more than 650 miles or more were left intact. There are many more 650 plus mile destinations that I wish to travel from where I am situated than less than 650 mile options, and I for one am glad that they are keeping the mileage needed for those intact. So, apart from your selfish concentration on one route that was good for you, the rest of the changes are better for the majority of Avios users — no increase. Sorry, Jessica, most people don’t take those short haul weekend get-away trips, nor do they fly to visit their children in college — if they can even afford to do so! Your sob story is ridiculous, so grow up from your self-centered upper middle class lifestyle. I don’t give a hoot, either, for those who plan trips to Dubai or Asia, or who use their miles/points for Singapore Suites or Emirates cabins, or the like — I zone them out. I look for good value, and although it is sad that this is going away, it is not the end of the world. Moreover, don’t ever try to wrap yourself in the flag of those who are poverty stricken — they can’t afford to send their kids to college, let alone fly to visit them — and stay in nice hotels, while doing so, or taking 3 day weekends to Cancun or Montreal or Toronto or Boston from various destinations in the USA. Yup, your price for your short-hauls has increased by about 67% — and less if you use IB Avios for some of those short-hauls, mind you — but don’t for a minute ever play the poverty card. Those who play this game — it is most certainly not a hobby — are usually college educated folks who have a good income and who know that they should pay their credit card bills off on time. They are not the types who are just scraping by and thus your claim that you can now only visit your daughter 1/2 the time is not only ridiculous, it should be ridiculed. @Horace WOW! Just Wow! I am so glad that you can be such an online bully and have so much intellect about me and my situation. You are truly disgusting and WRONG. 1. “It appears that Jessica is unique in her loss from the DC metro area” – WRONG – I mostly fly out of DFW. And, even if I did fly out of DC, you think I am the only person that uses that route? 2. “I don’t buy the tearjerker that she will have to visit her daughter less because the Avios price on the route has gone up! !” – WRONG – You have no idea who I am or my financial situation. 3. “apart from your selfish concentration on one route that was good for you” – WRONG – I use many routes from DFW, it’s just that the most important one is to see our daughter. 5.”Check out using IB Avios for your shorthaul flying to see your daughter in DC.” – WRONG – Again, not in DC. Never been actually. 6. “Otherwise, pony up the dough or the extra points” – Again, great advice without knowing me or my financial situation. How can a person be so cruel without even knowing the other person? 7. “the program was not made for you or your short hauls” – Never said it was but anybody with half a brain knows that this was the best way to redeem BA Avios. So, as stated in my original post, this is a big blow for anybody that was taking advantage of it. Period. If you weren’t able to then it’s not a big deal for you; however, it is for the people that utilized it often. Not saying it was MADE for me, just saying it hurts. 8. “There are many more 650 plus mile destinations that I wish to travel from where I am situated than less than 650 mile options” – And I am the self centered person? The program was not made for YOU or your mid-range domestic routes. 9. “So, apart from your selfish concentration on one route that was good for you” – WRONG – As mentioned, I used this for a lot of routes. Not just for me and my husband but for many of my family members because, if you knew me at all, you would know that I am one of this least selfish people in the world. And, yes, many members of my family are part of the non-educated, lower class. They work terribly hard everyday to make ends meat which I am sure you know nothing about. I send my aunt and uncle to El Paso twice a year to be able to visit relatives. I took my oldest nephew to Colorado to see mountains for the first time in his life (he is 20). I took my 3 other nieces and nephews to the gulf to see the coast for the FIRST time (they are 10-13). I took my grandmother back to New Orleans to see where she was from. My husband flies to New Mexico every couple of months to see his parents. I flew his brother’s family to see us for the first time in a year. And, yes, Avios helped with all those – all on 4500 AVIOS routes. So again, not just one route. And again, not selfish. 10. “the rest of the changes are better for the majority of Avios users — no increase.” – COMPLETELY WRONG – What about the people that don’t live in a hub and have to make connections? Anybody with 2 short haul flights just totally got screwed. As I mentioned in my second post, I believe this hurts people not in hub cities even more than me?!? You are a walking, talking contradiction. You keep telling me that the program wasn’t made for me and to get over it but it really seems like every point you make is “it doesn’t affect me so it’s no big deal.” Everybody has different needs and this will affect each person differently. I was simply expressing how it will impact me and my family. 11. “Sorry, Jessica, most people don’t take those short haul weekend get-away trips” – And how do you know this? How do you know what most people do with their weekends? 12. And the biggest one “nor do they fly to visit their children in college” – WRONG, WRONG, WRONG. Again, I am so glad you know me and my situation. But our daughter is not in college. She is a young, pre-teen girl that lives with her mother in a different state. She calls her dad every week and cries and begs to see him. We do the best we can and try to see her as much as possible but you have no idea how hard it is on everybody involved to not get to be as big a part of her life as my husband wants or she needs. So in less you are a parent that is UNABLE to hug their child every night before they go to bed then you simply have no room to talk. 13. “Moreover, don’t ever try to wrap yourself in the flag of those who are poverty stricken” – I wouldn’t dare, but I will tell you that I have slept without electricity, I have brushed my teeth out of gallon water, I have waited until Christmas Eve to get a Christmas tree because they were given them away for free. I buy my nieces and nephews new backpacks and school supplies every year so they don’t have to be the kids with nothing on the first day of school. So try to be a little less judgmental and a little more compassionate. 15. “Or taking 3 day weekends to Cancun or Montreal or Toronto or Boston ” – WRONG – never been to any of the places you mentioned. Those were just routes I named that people probably use. Me? No. But again, thanks for trying to be so belittling and condescending to a person you don’t even know. I did say we were LUCKY to get a 3 day weekend escape every now and again. We went to New Orleans for our anniversary which was wonderful. 16. “Your sob story is ridiculous” – It never was my a intention to create a sob story. And, frankly, I don’t think I initially did. I simply said that this a HUGE deal for most people. 17. “your self-centered upper middle class lifestyle” – WRONG – we have already addressed these points but I think you get a clear idea. 18. “but don’t for a minute ever play the poverty card” – F OFF!!!! 19. “are usually college educated folks who have a good income..They are not the types who are just scraping by and thus your claim that you can now only visit your daughter 1/2 the time is not only ridiculous, it should be ridiculed.” – So you are saying that because MOST people that use miles and points are educated and wealthy, that I fall into that same category? I may be educated but I am by no means wealthy and this will hurt the amount of time we get to see my daughter. Your comments just show how judgmental, condescending and egotistical you are. There are many different types of people in the world. And just because I don’t have as much money as you, doesn’t mean I’m not smart enough to play your stupid game too. The one thing I love about travelling, showing my niece the ocean for the first time, camping in the mountains with my nephew, talking to strangers in New Orleans, that get to show you that there is a much larger world out there. It makes you reach higher for your dreams, it makes you more compassionate, loving and understanding. It makes the human race all one. I try to never judge ANYBODY. Everybody is walking a different path. Everybody is struggling with something. However, sometimes, there is no amount of travel or education that can change a person. You, my friend, are a jerk. I could not be bothered to read all you wrote. @Horace, First, I wouldn’t have provided such personal information if you weren’t spewing such incorrect information about me. Secondly, if you don’t have the time or the inclination to get to know a person or their situation, then you shouldn’t carelessly pass judgement on the either. Well, I am going to do something that you don’t often seen done on these boards. I am going to issue you an unreserved apology for jumping the gun and misreading your posts and for that I am truly sorry, now that I have taken the time to read it more thoroughly. Quite frankly, you and I are somewhat similar in that we both detest the credit card pimping and the apparently great “ONCE IN A LIFETIME” LIFESTYLE choices, that many of these bloggers promote — while it is nice, I don’t need it for my ego to behave or live like that. I look for good value and will take advantage of decent deals in premium class if they come along, but for me, I prefer the simple coach awards that the rest of us fly. I mistook you for the former and not a kindred soul — my mistake and hence apology. I am sorry that this devaluation bites, but that is the rules of this game — take nothing for granted. I did not fall into the BA Visa trap for the simple fact that we had enough Avios points in our account from the last 40% AMEX MR transfer and I saw no reason to get more. In fact, I was glad to unload 60,000 of them in that BA Premium sale, still leaving with us with 60,000 — which we used when we visited my mother in law in TN and Nashville was our go to airport. Her sickness necessitated that she move to TX so the points still can come in handy, but the last minute flights to BNA were a blessing. I am sorry that the IB Avios scheme won’t really help you with the DFW – ELP runs that you do, but if SW flies there, then there rewards scheme, which tracks low fares and should offer some salve for your situation may be an answer. Nevertheless, I do feel your pain, but the changes have been coming fast and furious and will continue to do so. I am a somewhat different poster on these blogs as I look to fly Coach, and I also am neither a true churner nor a MSer. I read them to learn more about the intricacies of the programs and how to understand their rules. If a good deals comes up I will look into it — and these guys are good at publicizing it. But, I generally don’t do the things that they do to obtain their hordes — just my comfort level. @Horace, I really appreciate your apology and the time you took to read my comment. I 100% agree with you on the credit card pimping and once in a lifetime sales pitch. It’s really gotten out of control from when I first started in this game. I can’t say I don’t dream about flying first class around the world but I am happy for the opportunities that it has given us to see our family and have “real life” travels. I have been contemplating the BA Visa but glad I didn’t jump on it now. 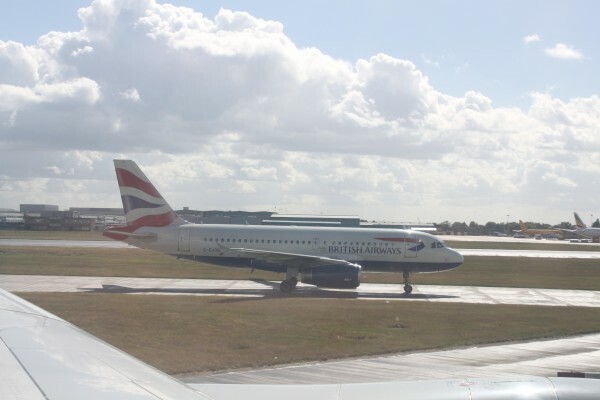 Fortunately, BA did give us warning and I will be able to use most of my Avios for speculative bookings in 2016. Also, lucky for me, Southwest does fly to all the places we frequent so I think it’s time for me to go after that CP. Just gotta keep rolling with the punches. I am indebted to you for your gracious acceptance of my apology . There have been some discussion about the alternative work arounds in light of the upcoming demise of the BA Avios short hauls — IB Avios, SW program and I also have read about LAN Kilometers, but I think the latter now worth it as you need to transfer in SPG points and I think that for such flights unless last minute business flights, the costs don’t match. I think the reason for this after having read elsewhere it two-fold — it really was too good a deal and AAdvantage killed it because it cut into their profits and it became too widely known. Also, probably with a possible AAdvantage devaluation, leaving this as is would have been even more of a $$ loser — hence, it’s demise. The only thing one can say that is positive is that for last minute emergency trips, it is still there, just at a higher cost, but still there, nonetheless. Whether 7,500 Avios will be worthwhile each way will now be dictated by SW costs, as well. Fortunately, SW is a transfer partner of UR, and although I don’t MS, a Chase UR business card might be helpful to you with their bonus categories, or a personal one, as well. Those points can be transferred into either BA Avios or SW points. Thanks for your helpful suggestions. I will look into the Iberia program. I’m not too familiar with it aside from getting to Madrid. There is no doubt that the BA program will still be useful at 7500 miles. Especially for last minute trips as you mentioned. Also, like you said, it is still cheaper than most US-based airlines as long as there are no connections. Another thing I use occasionally is the AA reduced mileage awards. Only slightly more expensive than BA now. But SW sales can be very valuable. When SW had a sale last summer, my husband and I flew to DEN for around 3000 miles each, RT! It was an amazing deal so you really just have to keep your eye out. I do have an Ink but only MS when it is convenient and I probably can’t get a new personal card since I have more than 5 inquiries. However, I have never had the SW cards. Probably go for both pretty soon to get the companion pass for 2 years. I guess it’s not the end of the world after all! Jessica — I know very little about the SW program but my spouse is now using them to fly to see her mom in Austin. Read the blogs and do google searches about it and whether it is possible for you to try to go for the Companion Pass whereby 2 appear to fly for the cost of 1. I have read that there are certain ways to accumulate all the miles in one fell swoop or increments that will get you over the threshold — one way is to pool Marriott Rewards and transfer them into SW’s program either thru a direct transfer of points to miles or thru their travel packages. I’m sure many of the bloggers have done stories on this Companion Pass in the past and that a search will uncover them, but it seems that SW credit card may, indeed, be in your future! I think that the IB Avios short haul deal is agonizingly just outside of your flight pattern — I believe that for 12,000 IB Avios one can take a R/T between El Paso and DFW. Unfortunately, mapping that out thru an airline calculator tool, I come up with a R/T of 1,002 miles, ever so close, but sadly outside of that sweet spot. I think that UR and SW points may be the way to go going forward. Sorry, I meant to say that for R/Ts of 1,000 miles or less, one can use 12,00 IB Avios, but sadly, I think that the ELP-DFW flights are just outside that limit, so no savings on that route.